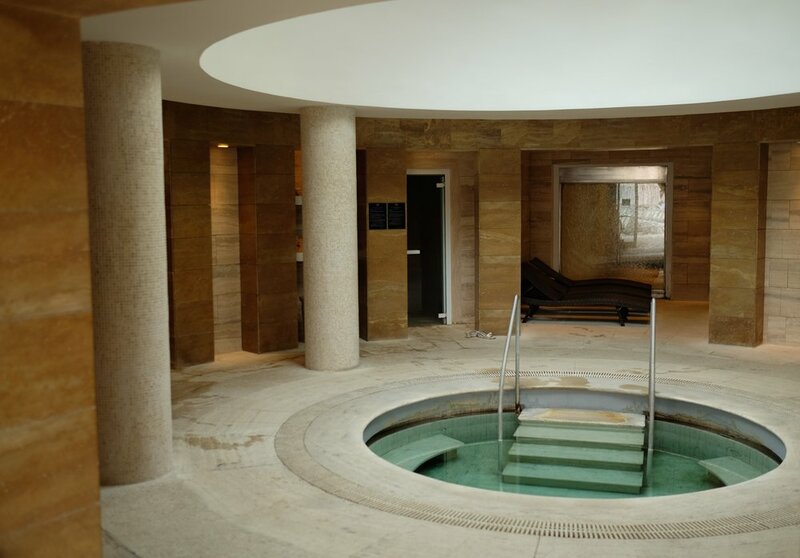 -Terme Di Saturnia sits surrounded by thermal springs that have been used for thousands of years, arguably the first spa and wellness retreat location! -You are encouraged to wear a robe the whole time. -The rooms are simple, have everything you need, including a super comfortable bed. -The restaurant at the hotel is AMAZING! Keeping it short... we will be back. We had two days in Rome, and ran a marathon. Basically. We walked over 27 miles. In TWO DAYS! That may sound crazy, but it's easy to do when you're in such a big, bustling, and beautiful city! In honor of our blistering feet, here are approximately 27 photos from our Roman adventure (just about 1 per mile). Our first day started with us arriving in Rome at about 10 AM. We took the train from the airport to the Colosseum (Alli nearly cried when we first saw it... the Colosseum is breathtaking) and then walked about a mile to our bed and breakfast, La Finestra Sul Colosseo. From the moment we arrived, we felt like locals. With only five rooms, La Finestra Sul Colosseo is small and unassuming, which we LOVED. The staff warmly welcomed us, pointed out their favorite places to grab a bite, and brought us to our room. We had a gorgeous, spacious room with a great air conditioning (a MUST if you are traveling in the summer! ), and a stunning view of the Colosseum. They even gifted us with some fresh fruit and a lovely bottle of Italian red wine - it's those little touches that make a place memorable! While we were tempted to relax in our air conditioned room, the city was calling us! First stop: the Colosseum. We decided to go in on the following day, but we were still able to capture some cool photos and enjoy the massive structure. We continued on and meandered through the streets until we found an incredible hidden gem. The Piazza della Madonna dei Monti. In this small Piazza there were a couple small restaurants, and picturesque fountain in the middle, complete with an accordion player serenading the passerby's. It was dreamy. Here we shared a yummy pizza (we're convinced you can't order a bad piece of pizza in Italy) and salad before continuing on our stroll. Our next stop was another hidden gem. The Vittorio Emmanuel II Monument. For €7 you can go to the top of this monument and enjoy amazing views of the city. We're not sure why this is a hidden gem, as it was one of the highlights of our time in Rome. There was nobody up there, and it was so beautiful! GO - this is a must-do! View from the top. You must go up here! There was nobody around and INCREDIBLE views! Next, we headed to the Pantheon (Bobby’s favorite) and got some gelato (Alli’s favorite). When traveling, it's all about meeting each other's needs! ;) Alli bought some local hand made jewelry and we headed back to our hotel for a quick air conditioned nap. After the recharge, we made our way to the Spanish Steps for the sunset. While it was a treck to get there, it was definitely worth it. The weather cools down significantly in the late afternoon, so we recommend taking advantage of your evenings! The day was capped off with an amazing dinner, and more exploration of Rome’s beautiful streets. 14 miles in one day, and it was time for some sleep. We woke up to our B&B's signature breakfast in bed. Talk about feeling pampered! This breakfast gave us the energy and ability to go out an do another 13.5 miles today. We started with touring the Colosseum, which is best first thing in the morning. You can easily avoid the crowds, and the mid-day heat! While we explored on our own, there are several tour options as well. Can you find Alli in the Colosseum wall? We hiked around Palentine Hill and took on some Colosseum Gladiators... because, "When in Rome!" Please note.. these guys will try to charge you €10 per photo. Negotiate your price first or be prepared to battle! We decided to head back through Piazza della Madonna dei Monti, and there we scored some AMAZING caprese sandwiches. Definitely take advantage of the hole-in-the-wall deli's, they're everywhere throughout the city. You can score some cheap and delicious sandwiches that you can eat on the go. Pair them with a cold beer or a bottle of white wine, and it's the perfect lunch! We decided we should just get some gelato. Because, gelato. From there we walked through Piazza Navona, to Campo de Fiori, across Tiber Island, across Ponte Palatino (where we took this photo). Next, we walked by the Bocca della Verita, around the backside of Palantine Hill, past the Colosseum, and started looking for a place to eat. We ended up at Naumachia, and we were obsessed. As incredible as it was (and looks), from the time we had gotten gelato we probably walked 6 miles to get here. So we were EXTREMELY hungry. Regardless, it was an incredible meal and definitely a local vibe. Make sure you get the tiramisu. We headed back to our lovely (and chilled) room, and had a great night of sleep. You definitely rest easy after a marathon. It may have been strenuous at times, but there are SO many amazing sights in Rome that we would do it all over again tomorrow! We arrived in Florence eager to find good food, visit Michelangelo’s David, and spend our evenings sipping wine and watching the sun go down from the Piazza Michelangelo. To be honest, we had no idea what we were getting into when we arrived at our hotel, the Relais Santa Croce. This eighteenth century residence is an incredible blend of luxury and modern comforts, right in the historic centre of Florence. Upon entering, you quickly feel and see the luxury of this magnificent property. While we were impressed by the facade and lobby of the Relais Santa Croce, our jaws nearly dropped to the floor when we entered our room. The Verrazano Royal Suite is nothing short of majestic. It has TWO large living rooms full of original 18th century frescoes, and a bedroom with (what we would argue) the most comfortable bed in Florence. The living rooms have numerous areas to sit and enjoy tea, a large conference type table for meetings, a office area, and more comfortable couches to relax. There are two bathrooms - one with a gigantic bath tub and amazing shower, and another full bath with all the necessary amenities. The closet was bigger than some of the rooms we have stayed in. Not kidding. Can we remind you that it was just two of us staying here? We didn’t want to leave. We spent time sitting in every area of our room and soaking it in. Bobby pretended to work in his office while Alli enjoyed the luxurious bath. We spent time on opposite ends of our suite, hollering at each other - just because we could! While we had plans to explore a good chunk of Florence during our short stay, it was really hard to leave the Relais Santa Croce. As frequent travelers and hotel-stayers, it may seem weird that we're gushing about this hotel. But the Relais Santa Croce provided us with a royalty-like stay that we have never experienced. We literally felt like a royal couple, or important foreign dignitaries, or celebrities. Did we mention that Brad Pitt and Angelina Jolie have stayed in our suite? Thank you for the elegant stay, Relais Santa Croce! We can’t wait to return! This month, American Express Travel has asked us to contribute to their #Journeymakers campaign in an effort to encourage travelers to acknowledge and thank those special people that have made their journeys unforgettable. In our first blog reflecting on #Journeymakers, we shared about Moroni, the lovable bellhop from Panama City. Today we're featuring Martina, a delightful hotel manager from our most recent stay in Pienza, Italy. When beginning to plan our Italian adventure, our hope was to get beyond the touristy areas - which can be extremely hard to do in the summer! We knew that we wanted to spend time in Rome and Florence, but we also had the desire to explore the countryside of Italy as well. We decided the best way to do this was to rent a car in Rome, meander our way through Tuscany, and then head to Florence. Looking back, we are SO thankful we did! We made our way from Rome to Pienza, an incredible medieval hilltop town in the Val d’Orcia region of Tuscany. We arrived at our small boutique hotel and met Martina, the bubbly manager who got us all settled into our room. She asked what our plans were during our stay in Pienza, and we told her that we wanted to experience the local culture. She immediately mentioned a nearby restaurant that we must try for dinner, and jumped at the chance to plan our next day for us. While we were a little reluctant to have her plan out our full day (we enjoy a little flexibility - and isn't planning part of the fun? ), her smile and excitement were all the convincing we needed! Trusting Martina with our day was completely solidified a few hours later when we were dining with the locals at the delicious Tuscan restaurant she recommended. While we were eating breakfast the next morning, Martina approached our table with the biggest grin, letting us know that she had arranged a wine tasting at a small winery in a rural nearby town, AND a private wine tour and lunch at one of her favorite local biodynamic wineries. This sounded great to us! At the first winery, we enjoyed some wonderful Brunello and even better views of the rolling landscape. Next, we took a windy dirt road about thirty minutes into the Tuscan hills. We eventually came upon Piombaia, a small biodynamic winery. We were greeted by Roberto and his wife, and noticed we were the only people there. Roberto gave us a tour of the winery, explained what life is like as a biodynamic farmer, and shared the history of his family (Seven generations of his family have operated this winery). He then sat us down in a picturesque little dining room, and he and his wife proceeded to feed us an authentic 5 course meal. EVERYTHING we ate was grown at their farm and made in their kitchen... Even the olive oil! It was absolutely incredible, and we spent a good amount of the time laughing and pinching ourselves over the experience. Here we were at this tiny winery enjoying superb Italian meal. In the moment we didn’t feel like tourists. We felt as if we were just visitors or friends of Roberto and his wife. It was an absolutely dreamy afternoon! We returned to our boutique hotel and found Martina, who was eager to hear how our day was. We shared all about our experiences and thanked her for all she had done for us. While Martina could have directed us towards the big name places where all the tour buses go, she took the time to create an experience for us that was unique and authentic. And for that reason, Martina is a journeymaker that we will NEVER forget! *Sponsorship Note: This post was created in partnership with @AmericanExpress Travel celebrating their 100th year anniversary through the #Journeymakers campaign. Share your Journeymaker story here. All content, words and ideas are our own. Thank you for supporting the sponsors that allow us to create and maintain original content for this blog.